An unplanned Friday night. As the one week countdown clock is on to the Rio Tinto Dragon Boat festival, my sore muscles were crying out of a hot tub. Unfortunately, the hot tub at the Jericho Tennis club was broken. We had planned a quick bite home, but now had time for an actual dinner out. 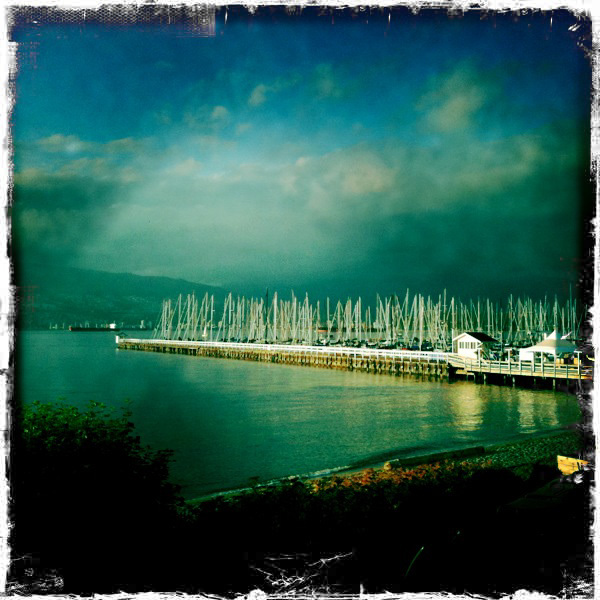 Before went in search for dinner, I took a moment to try out the newest app on my iPhone, Hipstamatic. With no plan in mind, we decided to drive down 4th Avenue in hopes something would inspire us. This is never a successful exercise in my life. Usually what ends up happening is Ben will name out all the restaurants, and I just become grumpier and grumpier at the thought we didn’t have a plan and that nothing was going to suit my fancy. But I’m trying to be less fussy these days, so when Ben suggested Maenam, much to his surprise and mine, I shouted, “YES!”. We were lucky to get a seat at the bar on a busy Friday night. Sitting at the bar is my favorite place when we have dinner for two, generally because you get to check out the bartender in action. I started with a delightful sparkling wine with lychee and lime and our first course came out quickly. 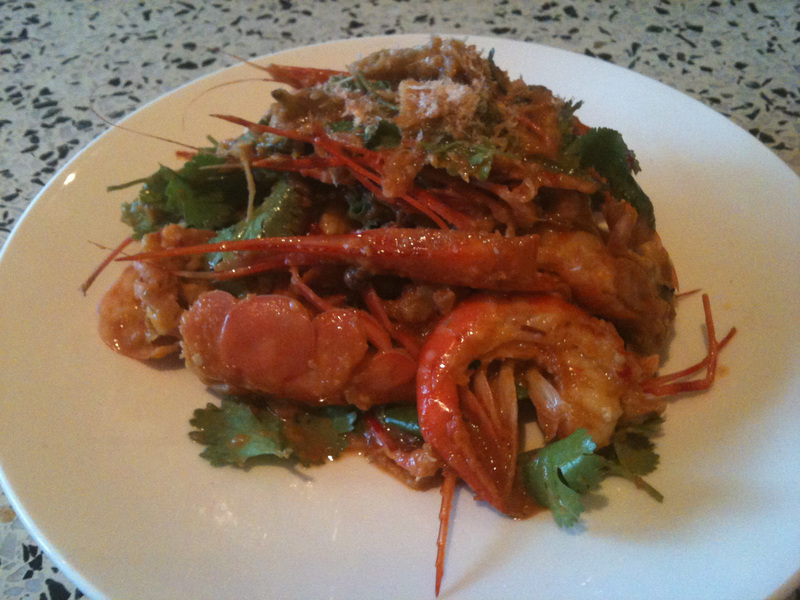 Since it’s spot prawn season, we went with the “monk’s offerring” Salad of Spot Prawns w/fried shallots and chiles. It said it had a toasted chile dressing, but it tasted more like a peanut sauce. Either way it was delicious. A bit of a jumbled mess of the plate, there was still great light Maenam when the first plate was served. Taken w/ my iPhone. 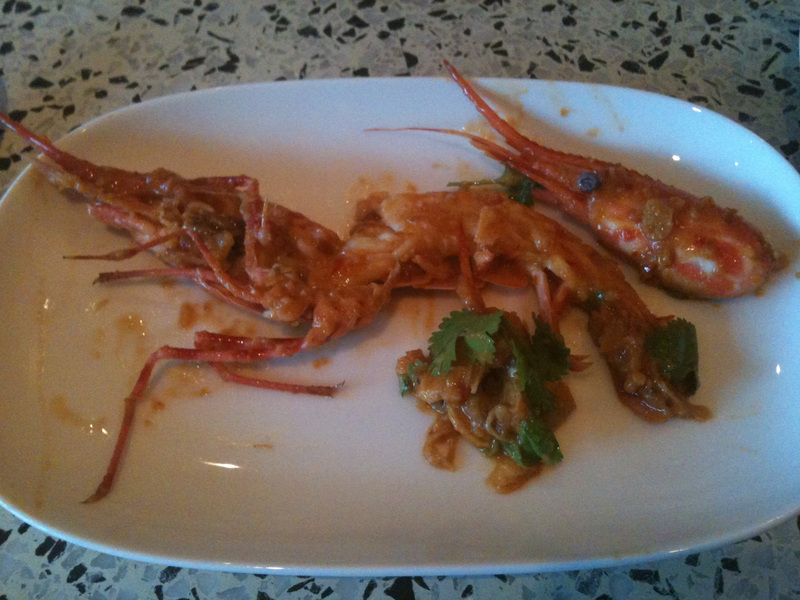 The prawns were split and perfectly cooked. The gooey deliciousness of the head was easily accessible served in this manner. 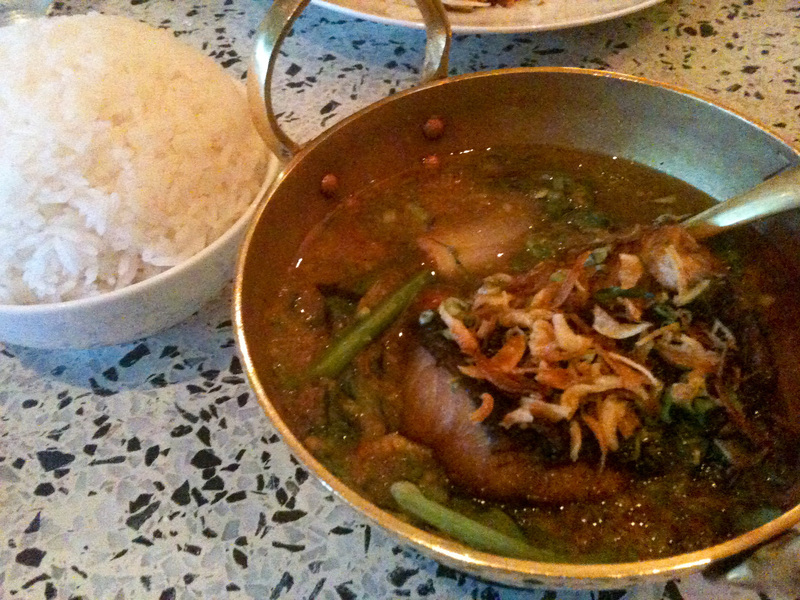 After a lengthy wait, we were served our next dishes, pad thai and Jungle Curry of Sablefish. The pad thai here is a bit of a revelation, unlike anything I’ve had outside of Thailand. You can tell they’ve got it right when it doesn’t come out ketchup red, but it’s more of a browny-orange colour. You could really taste the tamarind and fish sauce and the noodles were perfectly chewy. 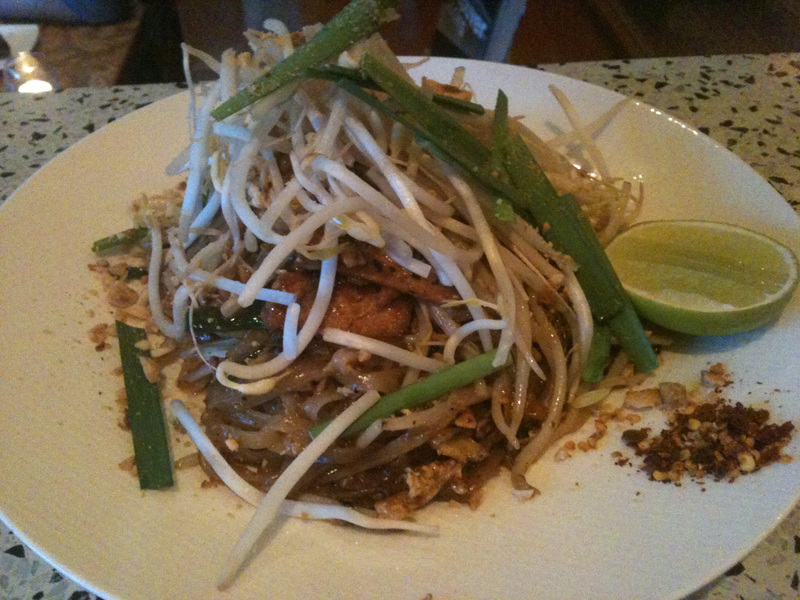 Yummy pad thai with a plethora of bean sprouts, peanuts and green onions on top. Extra chilies are served on the side so you can control the heat yourself. The jungle curry was a solid choice as well, although our least favorite of the evening. This may not be a fair judgement because I think I’m just tired of ordering sablefish. The spices in the curry were very agressive, although I couldn’t help but think that it was missing something. What ingredient though, I couldn’t put my finger on. I do find that the distinct flavour of sablefish takes over any dish it’s in, resulting in a sameness whenever I have it. 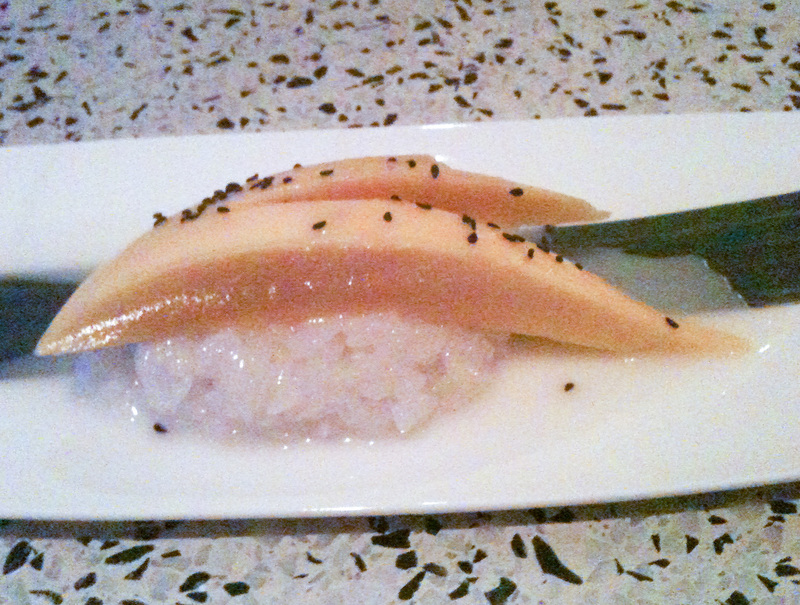 We don’t usually order dessert, but something on the menu caught my eye, Sticky rice and mango! A version of this at Lotus of Siam in Las Vegas is my hands down favorite dessert. I’ve never had it outside of that restaurant before. But then again, I’m not a big dessert fan and have never read the dessert section in other Thai restaurants before. Maenam’s version was good, although the coconut cream on top was a bit sweeter than I woud have liked, the mango not quite ripe enough and the rice could have been stickier. Mango w/sticky rice. The lights so bad that this photo makes it look like a piece of sushi. Oh well, I’m not so sad, because I’m in Vegas in two weeks, so my craving will be totally satisfied there. Stay tuned for that post, and you’ll learn all about my other favorite… Crispy Rice Salad! Awesome pictures. I wanna try this spot. Do they take reservations?